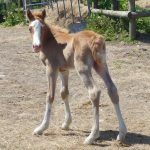 We are receiving a number of enquiries and much interest in our 2017 foals and have already had a deposit for two of them – one being only a week old. Both fillies will be going to lovely new homes which makes the parting much easier! A deposit will secure to weaning. All mares have now foaled, except for an older mare which returned and will have a late foal – probably late July/beginning of August. She has been covered by Cremello Stallion Tresorya Cornish Cream. Foal expected to be buckskin or palomino with a very small chance of a smoky black. We also have some lovely yearlings available For Sale. 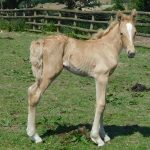 SMART SUBSTANTIAL BUCKSKIN FILLY ARRIVES – A REAL CRACKER! 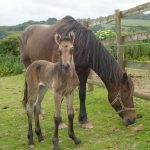 Another exciting day as Tresorya welcomes the arrival of a very smart large buckskin filly by Welsh Part-bred Cremello Stallion Tresorya Gwynhaf Llawen, and out of a very large mare with superb bloodlines – Derwen Tia’R Talwn by Derwen Quartz. The filly is very friendly and the photo was taken when only a few hours old. Her name has not yet been chosen. SO DELIGHTED WITH TRESORYA CORNISH CREAM’S FIRST CROP OF FOALS! ANOTHER FILLY ARRIVES TODAY. We are delighted to welcome another beautiful Palomino Filly by Tresorya Cornish Cream and out of Terackie Indian Flower. She was born in the early hours and is a very smart filly with lovely conformation. What an exciting week! 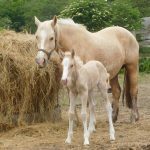 Another Palomino Mare to foal at anytime – also covered by Tresorya Cornish Cream. EXCITING DAY AT TRESORYA WITH THE ARRIVAL OF 2 NEW FOALS – 2 FILLY FOALS!! During the morning whilst showing someone the new arrival we had a surprise when we found another foal had arrived, and in such a short space of time! This time a very pretty filly by Full Welsh Cob Section D Licensed Stallion Tresorya Cornish Cream with Derwen and Nebo bloodines, and out of Greenwing Cornish Fudge, Grandsires: Trevallion Valentino and Trevallion Flash Jack. At the moment her colour is uncertain whether Palomino or Cremello? She is also very pretty with a blaze and 4 whites. Photo on right of Tresorya Cornish Fantasy taken when I day old . BOTH PRETTY FILLIES ARE OFFERED FOR SALE AND A DEPOSIT WILL SECURE TO WEANING. Really delighted with the foals this year and all are growing well – each beginning to show their personality! Mums are doing well too and both mares and foals will shortly be moved to a larger field which will be designated – Mares and Foals field! Expected to foal next is Tresorya Llywela Cain who has been covered by W.P-B.R. Tresorya Gwynhaf Llawen. The foal will be 7/8 Welsh D and either Buckskin/Dun or Palomino – More likely to be buckskin. 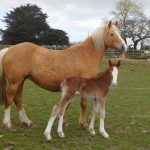 Followed shortly by three Palomino Mares which have been covered by Cremello Licensed Stallion Tresorya Cornish Cream. 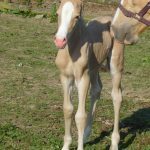 Foals will either be Palomino or Cremello. With foaling one never knows the order! Hopefully foaling will go well and we can look forward to healthy new arrivals. 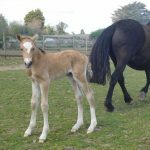 FIRST FOAL ARRIVES BY LICENSED CREMELLO STALLION TRESORYA CORNISH CREAM – A REAL CRACKER! An exciting day today as the first foal arrived by our Full Welsh Section D Cremello Licensed Stallion Tresorya Cornish Cream. A beautiful buckskin/dun filly born around 6.30am out of Tresorya Derwena Lwcus by Derwen Royal Express. She is really smart with 4 whites and a Star. A large foal which should mature to a good height. This mare has produced some super foals to date! ANOTHER FOAL ARRIVES ON EASTER MONDAY ! 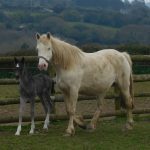 FIRST FOAL ARRIVES FOR 2017 ON GOOD FRIDAY – WHAT A LOVELY START TO EASTER! We have just weaned 4 of this year’s foals. Tresorya Nara Lwyd, Tresorya April, Tresorya Dancing Levana and Tresorya Prince Charming are now all 6 months old, growing well and already becoming independent. They are all sharing a large stable and adjusting well. Mums are fine too, having already experienced the procedures. Now we will see more of their personalities, and handling commences! Three of the foals are offered for sale and will be ready to leave the stud towards the end of November. If interested in any of the foals, arrangements can be discussed with regard to reserving and holding them.